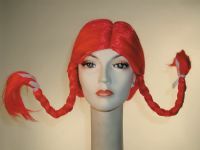 Deluxe quality Pippi style with wired braids. Works for the Wendy's girl as well. Neat wig! NOTE: THIS COMES ONLY IN RED .. NO OTHER COLORS ARE AVAILABLE. THANKS.